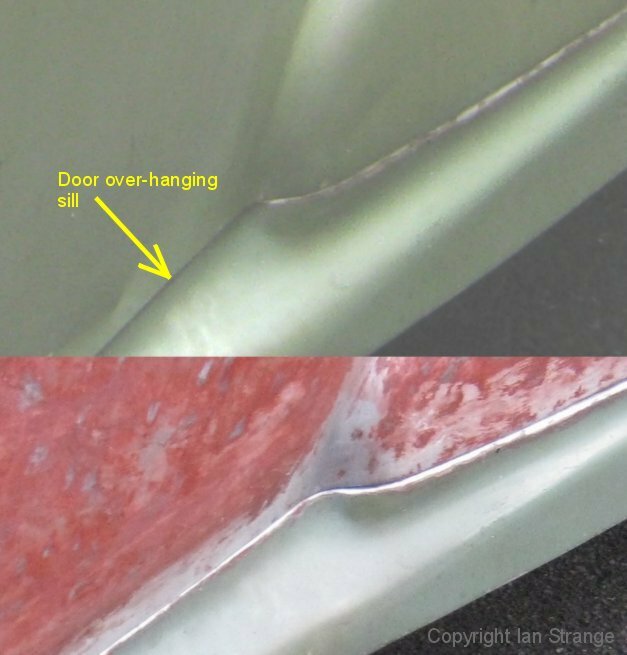 Repairing damaged panels did not go smoothly. I tried out the HTS2000 brazing alloy, and while it worked very easily on the pure aluminium sheets I practiced on, my attempts to repair the AC's panels resulted in more damage to repair. To be fair, the UK wholesaler and the American makers, were very helpful, but I gave up. 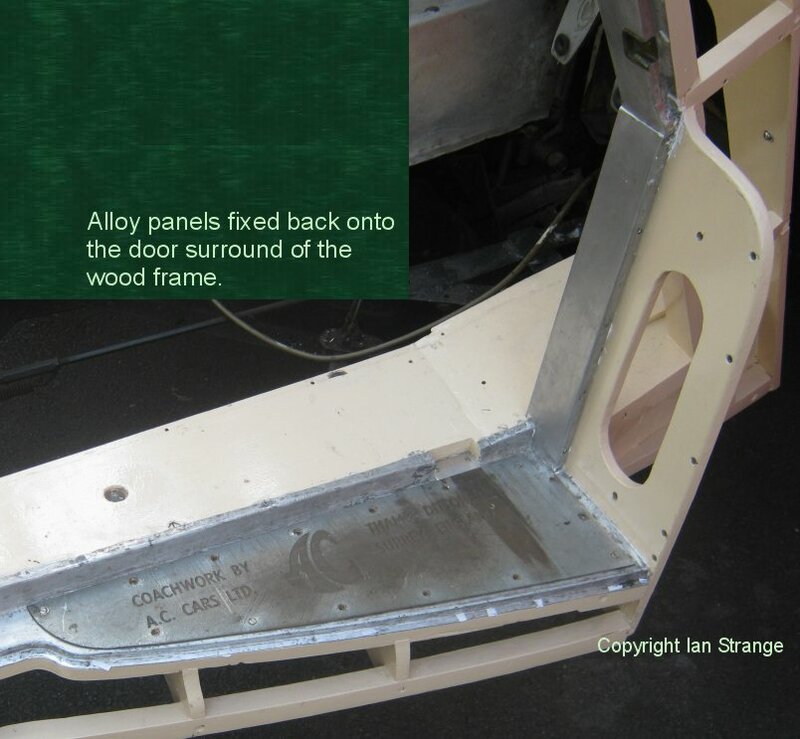 As far as I know, the AC's panelling is an aluminium-copper alloy as used for aircraft. Oddly enough, some 30 year old repairs I had done with Araldite (epoxy) adhesive, had held quite well, despite minimal surface preparation back then. So I ordered some Araldite metal epoxy, plus some fibre-glass reinforcement mesh. I'll write up more details later this year. Now I'm preparing the main bodyshell for refitting to the wood frame. 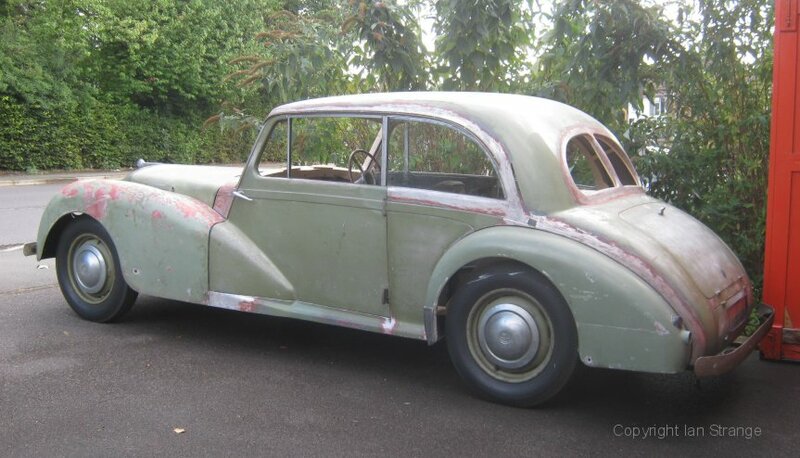 Undoubtedly the most worrying stage of the whole restoration! 3rd September 2015: AC re-shelled. 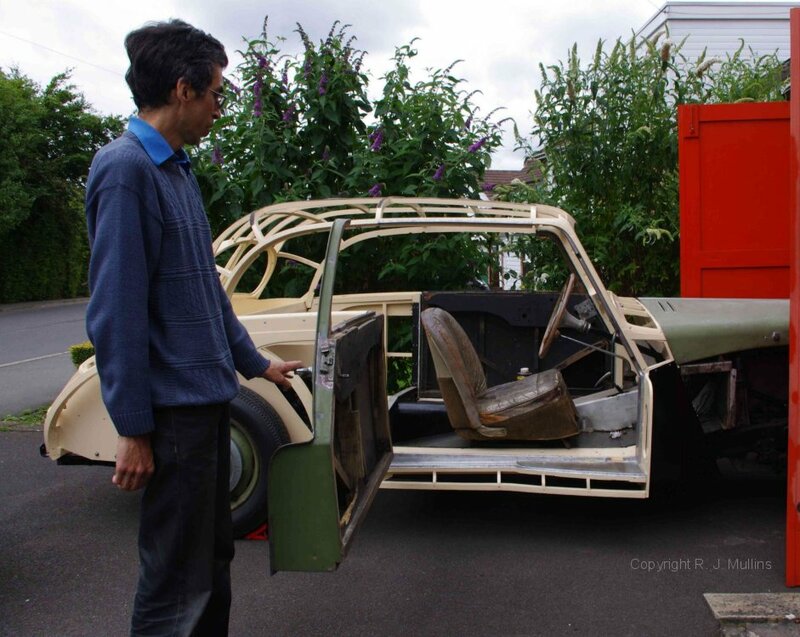 On the 17th August, the bodyshell was lifted out of the garage and onto the wood frame, 24 years after being removed. After a bit of persuasion, it all still fits, and far fewer panel creases than I had feared. I had altered one of the screen pillars on the wood frame for a better door fit, and this meant also changing the fold-line on the panelling. After over 2 weeks of intensive work, all the panel-pins are in and the edges all folded back over the wood frame. The doors, wings and windows still fit! The only slight downside of the lifting operation, is that the largest of my crack repairs (epoxy/fibre-glass) did not survive the ordeal. This was on the thin strip below the spare-wheel door, which is subjected to flexing during the lift - far more than it will suffer when mounted on a sound frame. It feels like I have my AC back again, now that I can admire or sit inside almost a whole car. Many thanks to the kind gents who assisted in the body-lift. Next on the agenda: Door restoration. Postscript: Since my AC has taken shape, it's been bombarded with even more compliments than before. Youngsters heading home from school call out their admiration, and passers-by (male and female, young and old) have nice things to say. And all this when the AC's paintwork is in a shocking state! It all helps to keep me going with such a long project. It's a wonderful contrast to the comments I used to hear and read over 20 years ago. Good taste has made a comeback! 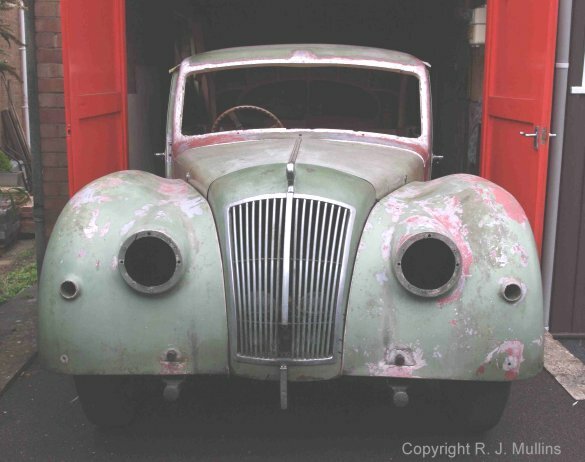 Driver's door: The woodworm had done rather more damage than I had realised initially (rascally fellows!). 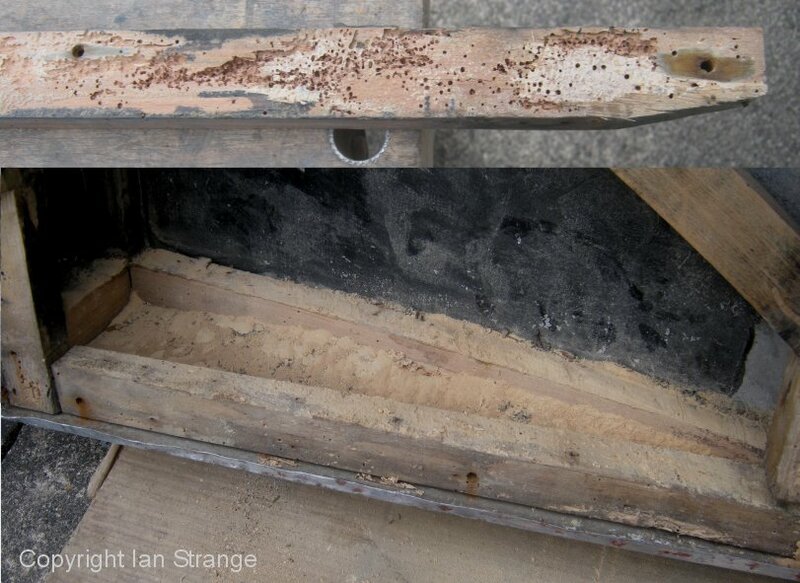 Nearly all the bottom of the door frame was destroyed, and what they had missed out, rot had taken care of. Note that there are shortcomings with the rain-water drainage in these doors that is easy to put right. Notably, the panel under the door, might be partially pushed into the drainage holes, which then traps water between panel and wood. The solution is to trim away excess panel around each hole. If possible, fit something inside to prevent water getting into the bottom rear corner, and also down the side of the wooden base-rail. Ironically, all that wood damage permitted me to put right another problem. The bottom profile of the door did not match the doorstep shape. 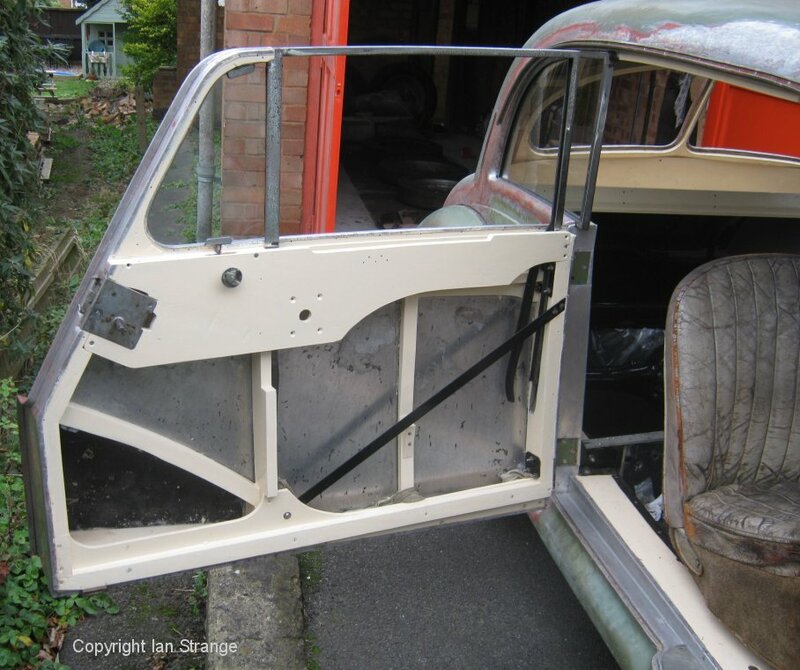 This meant altering the profile of the wood at the base of the door, and then altering the aluminium strip that reinforces the door edge, and finally panel-beating the main panel into the new shape. The down-side was that I could not test fit the partly dismantled door. The only test was the final fit! Another alignment problem concerns the window frames, and this seems to affect a few ACs. 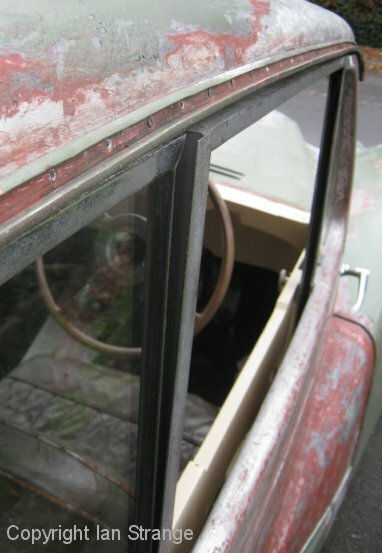 The top rear corner of the door window frame, does not align with the rear/side window frame, leaving a gap under its flange. This is due to the door window being vertical, and the rear/side window sloping slightly. I'll go into more detail about doors in due course, in the restoration section. The passenger door looks to be in better condition... I hope!